The day did not start out bad on Saturday 6th October, but by lunchtime the heavens had opened and there was torrential rain. 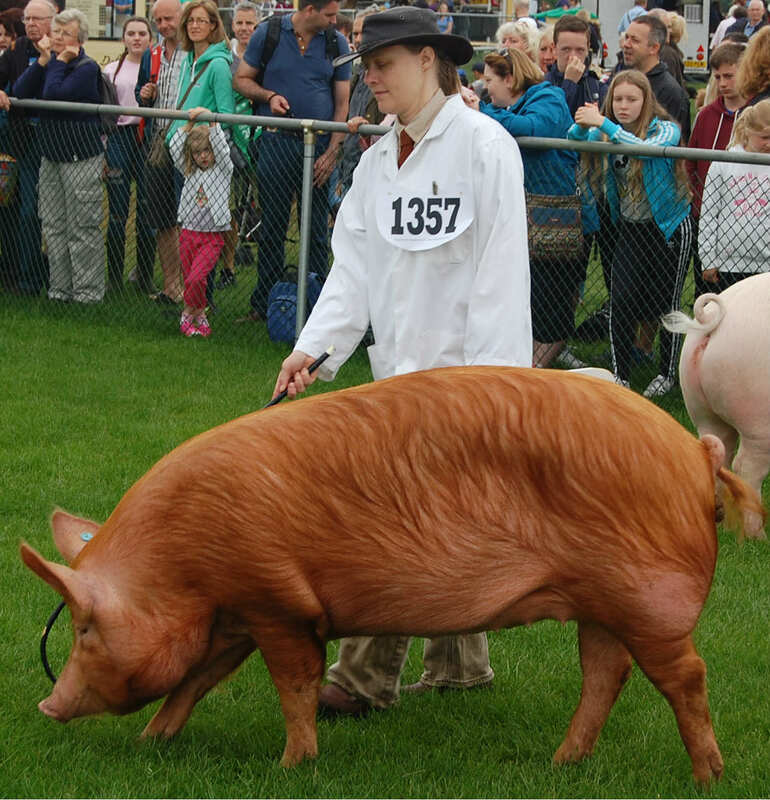 All the arena demonstrations were cancelled and the public exited en masse. 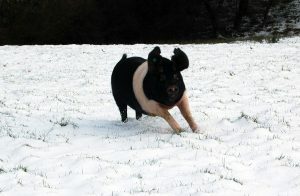 Luckily our pigs were in the Abergavenny building in the dry. 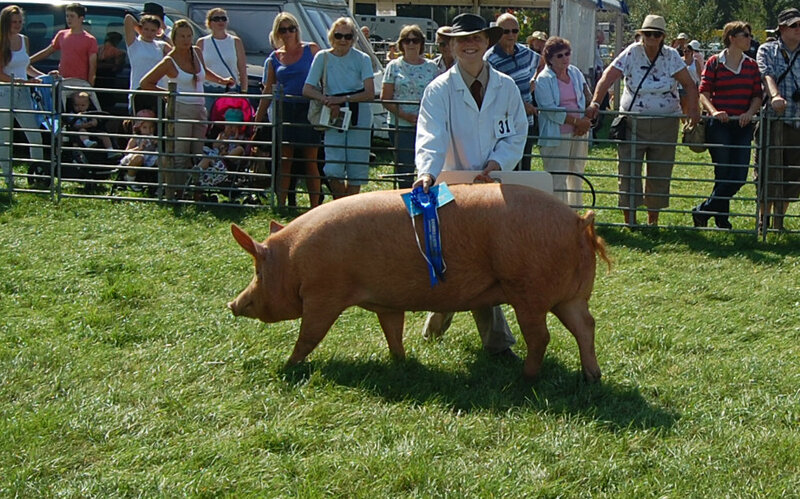 Sunday could not be more different with glorious warm sunshine and loads of people there all day. 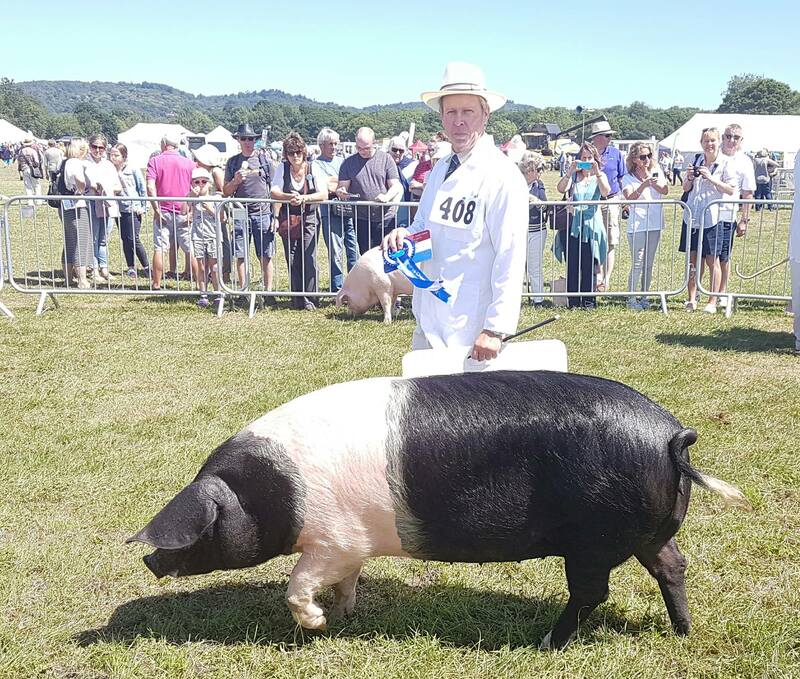 We took some of our show pigs for next year including Tamworth, Saddlebacks and Landrace and they soon got used to people stroking them and all the sights and sounds of the show. The new series of Celebs on the Farm started at 10pm on 5Star on Monday 20th August. 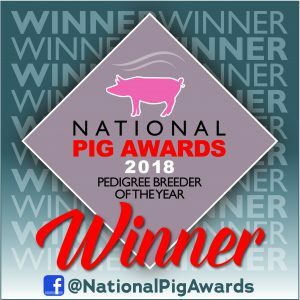 Episode 4 on Thursday 23rd August was their day with us at Oaklands Pigs. 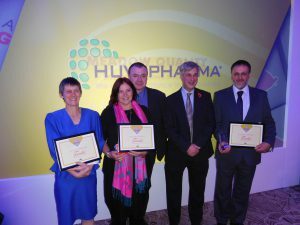 If you missed it you can still catch up on My5 at My5TV . 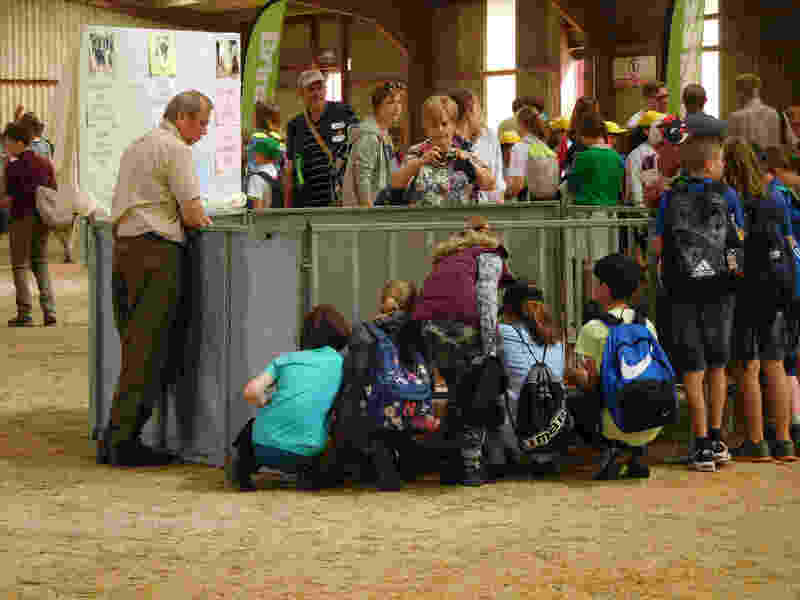 The weather was warm and sunny all through the three days of the South of England show. 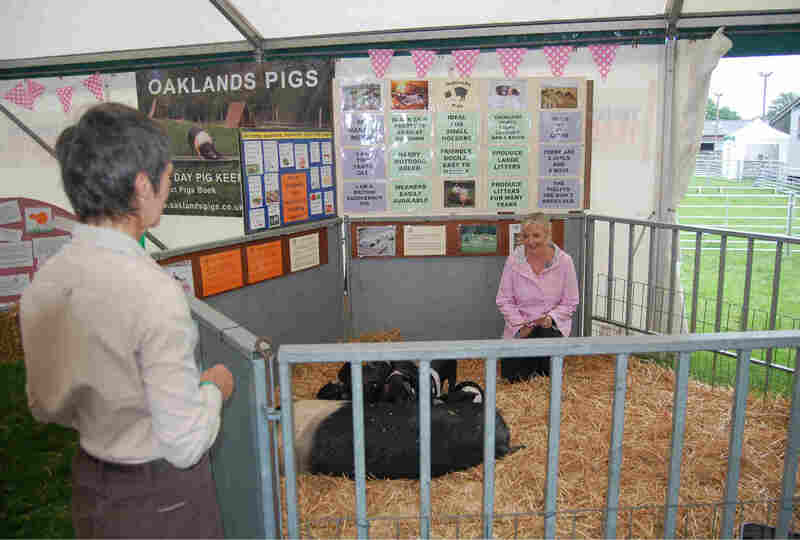 Oaklands pigs took 9 show pigs from 5 different breeds, as well as a sow with her 8 piglets for the pig village. That involved two trailer loads to get everyone there on the Wednesday setup day. 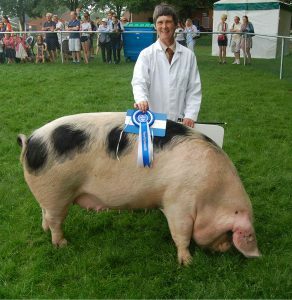 Greta the Old Spot won Best of Breed, repeating her win of the previous year. 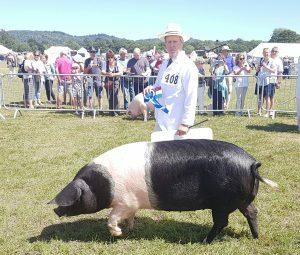 Tara the Tamworth then won her Best of Breed, again a repeat of her 2017 win. We also won best Landrace at last year’s show with our junior boar, but this year we again won Best of Breed but this time with our July Gilt Lorna. So we once again had three pigs in the Interbreed Championship which was held on the Friday. 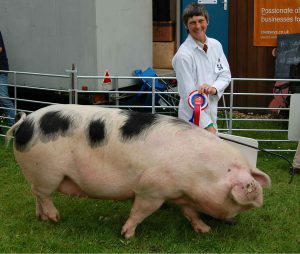 Sadly no awards there, with the Supreme Champion being a Large White and the Reserve taken by a Berkshire. Gerry one of our Kune Kunes is getting into the festive spirit by sporting his Christmas hat and tinsel. 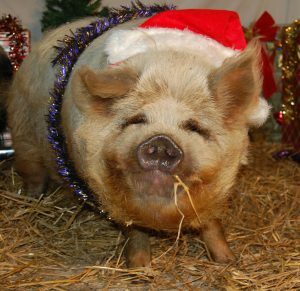 He says he has been good and is hoping for some apples in his stocking. 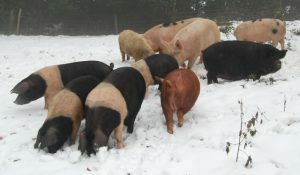 Snow arrived today in the South East corner. But the girls don’t seem to mind. Oaklands Pigs were again at the South of England Autumn Show with a pen of pigs in the farmyard section. 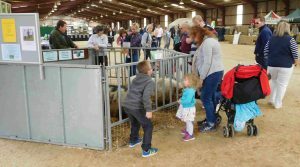 Saturday was bright and sunny and there were a lot of visitors to the show. 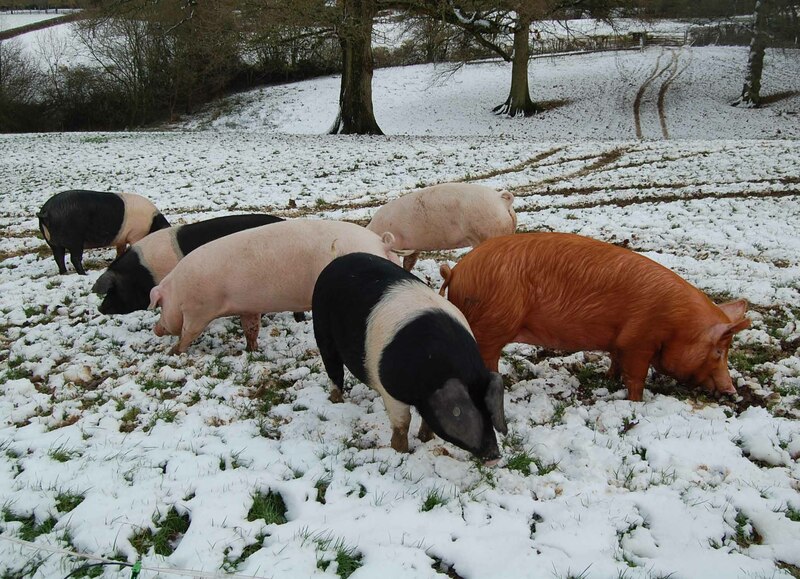 Sunday however started wet, rallied for a dry spell in the middle of the day, before lapsing back into drizzle. We were snug and warm in the covered Abergavenny building, which became quite busy during the showers. But the wet weather left many cars being towed out of the carparks through a sea of mud at the end of the day. 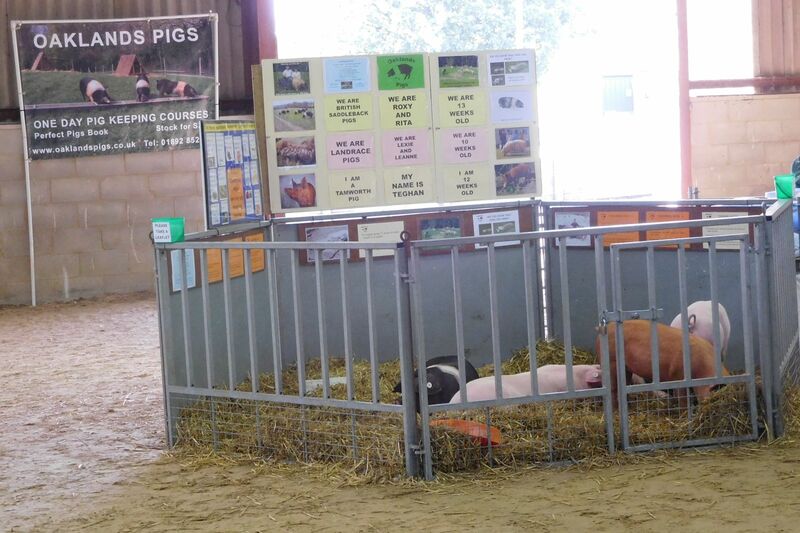 We had lots of enquiries and talked to many potential smallholders about the joys of keeping pigs. 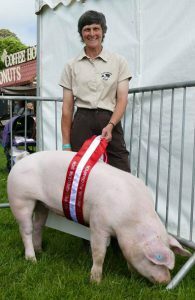 Tara the Tamworth certainly strutted her stuff at the weekend to come 2nd in a class of 11 for the July Gilt group. Tamworths do not normally feature highly in mixed breed classes, so to come second was the highlight of our day. 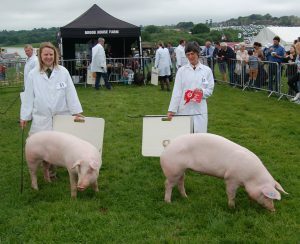 The other pigs in the team all played their part and we came away with Best Tamworth, Best Old Spot and Best Saddleback. So a nice end to the showing season for 2017. 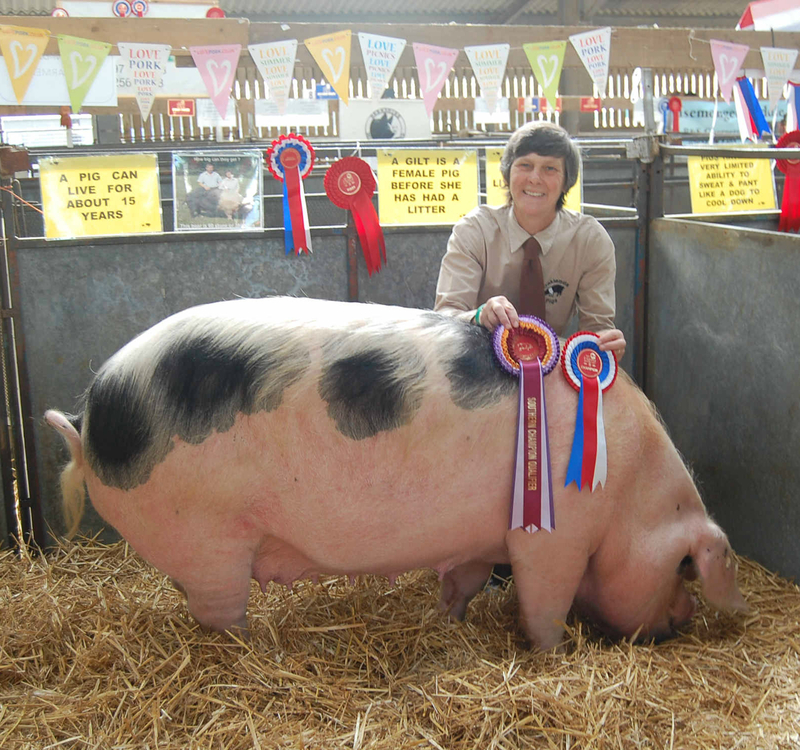 Blodwen, our Saddleback born in July last year took Reserve Champion at the Cranleigh show. 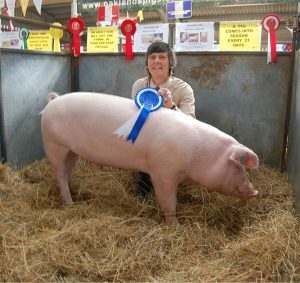 It was a very hot day and we struggled to keep the pigs cool in the marquee as there was hardly any breeze, but a plant sprayer full of water helped to damp them all down. 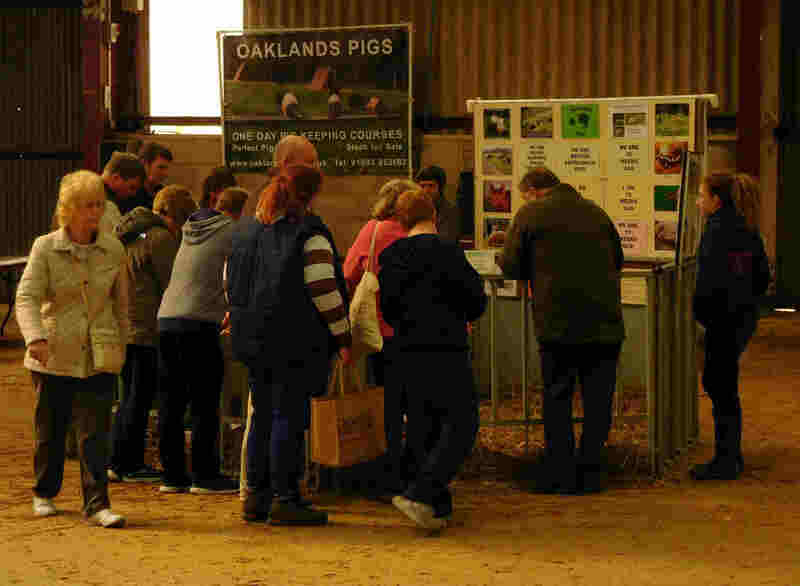 Oaklands Pigs once again attended the “Connect with the Countryside” event at the South of England showground. 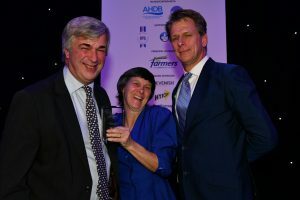 Around 5,000 children from Year 10 and 11 came from schools around Sussex, Surrey and Kent. We were part of the farm animal section with cattle, sheep, goats, donkeys and poultry amongst other more exotics. 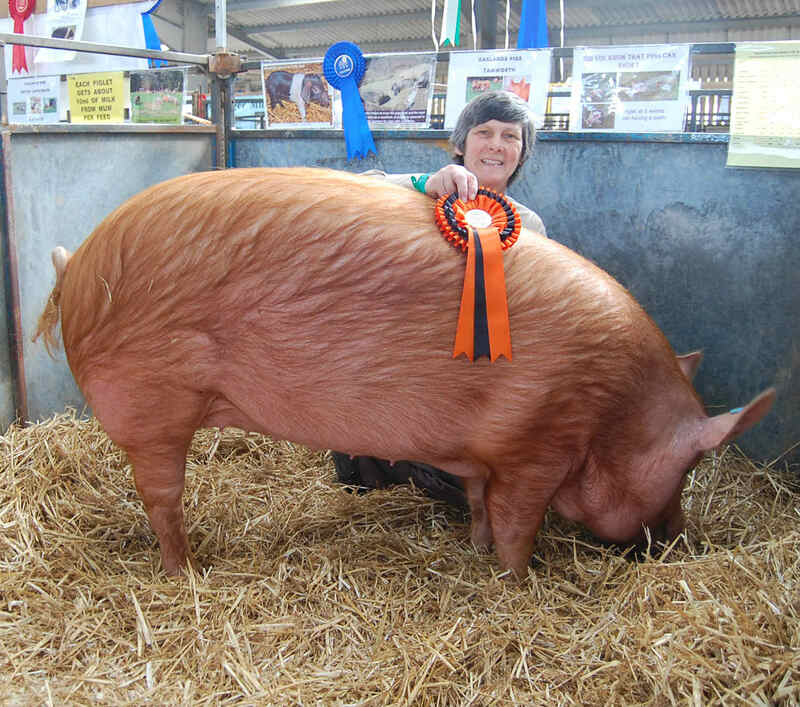 A lot were surprised to see how big pigs were at six months old and many did not know that pigs had hair, they thought they would be smooth skinned. 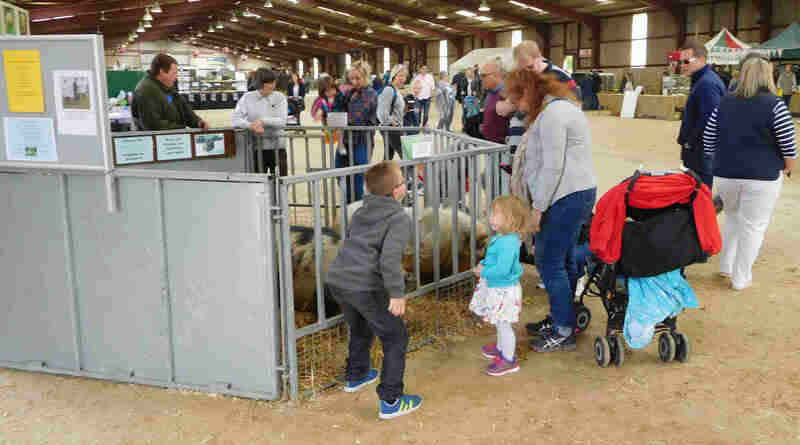 Our two January born saddlebacks and a January born Landrace were already experienced hands at the shows and were not phased at all by the crowds of children all wanting to stroke them and slept through most of the shouting and running around from the excited onlookers. 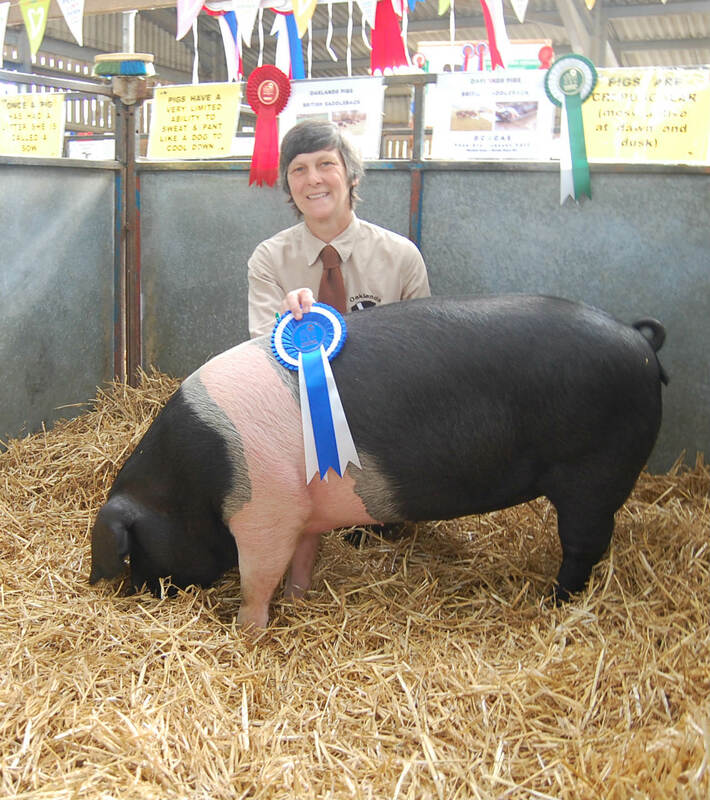 Oaklands Pigs were delighted with the results at the recent South of England show. Winning 3 breed champions and 1 reserve champion from the four breeds that we exhibited there. 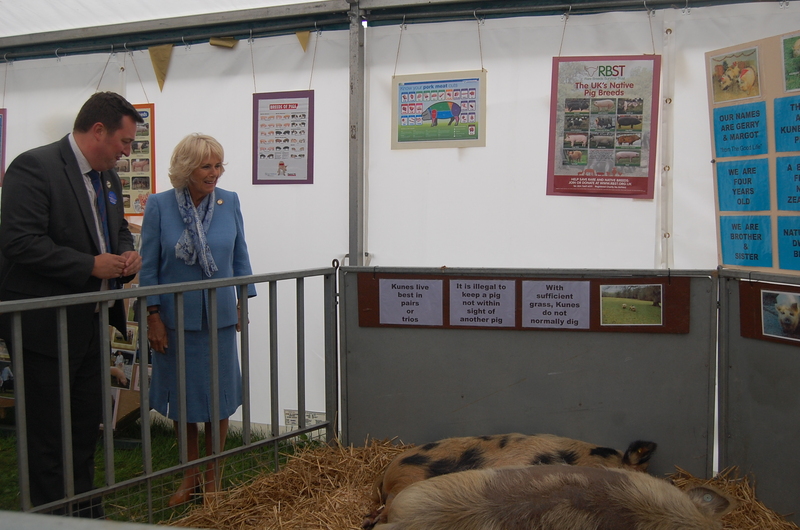 The Duchess of Cornwall came to the South of England Show today, and toured the pig show areas where she admired Oaklands Pigs saddlebacks, and the ‘pig village’ – a pig exhibition – where our two Kune Kune pigs were quietly sleeping. Well it may not have been quite tropical weather at the Surrey County Show on Bank Holiday Monday, but Clare and pig Bessie dressed in Hawaiian style to win the fancy dress competition. Our Tamworth Tara then won the prettiest pig class as she strutted her stuff around the ring. Fun classes aside, all our girls showed well in the main pedigree classes which was the main point of the show. 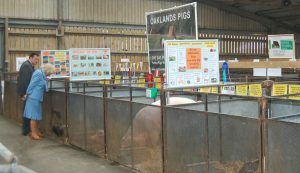 Oaklands Pigs ventured into the world of Commercial pig showing today at the heathfield show. 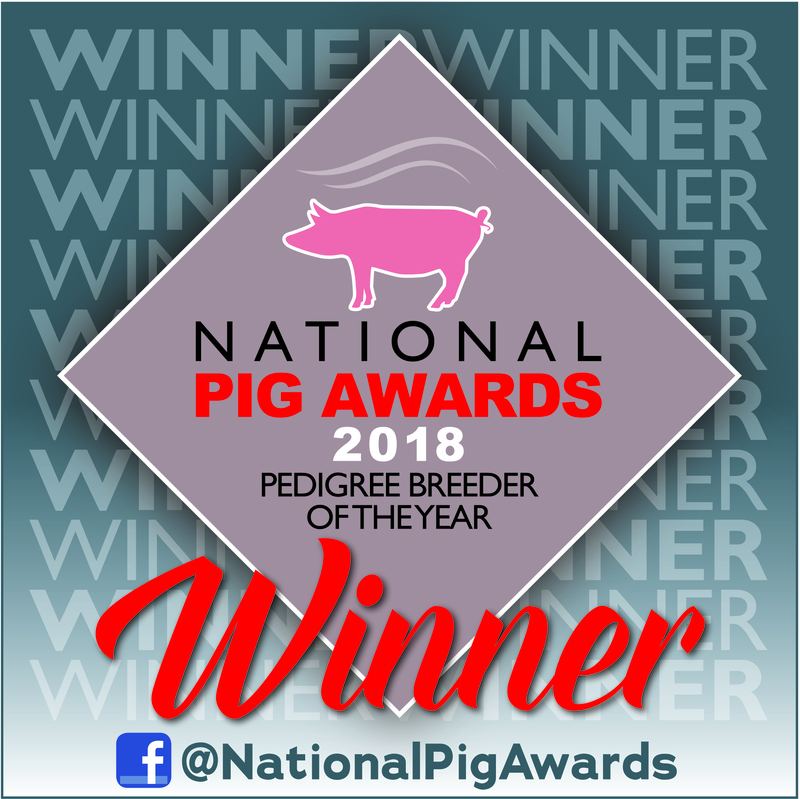 We entered our Landrace pigs born in Jan 2017 and the brother and sister pair Lancelot and Loretta won the best commercial pair, and Loretta went on to win the overall commercial champion. Lancelot also won the Jan born boar in the pedigree classes of the main show and qualified for the final best in show group, but it was not his lucky day today. 11 chefs came to Oaklands pigs yesterday to see how we rear our pigs, and find out about the differences between commercial pigs and rare breeds. They met the sows in the field and saw how rare breed pigs are raised, and how this improves meat quality amd taste. 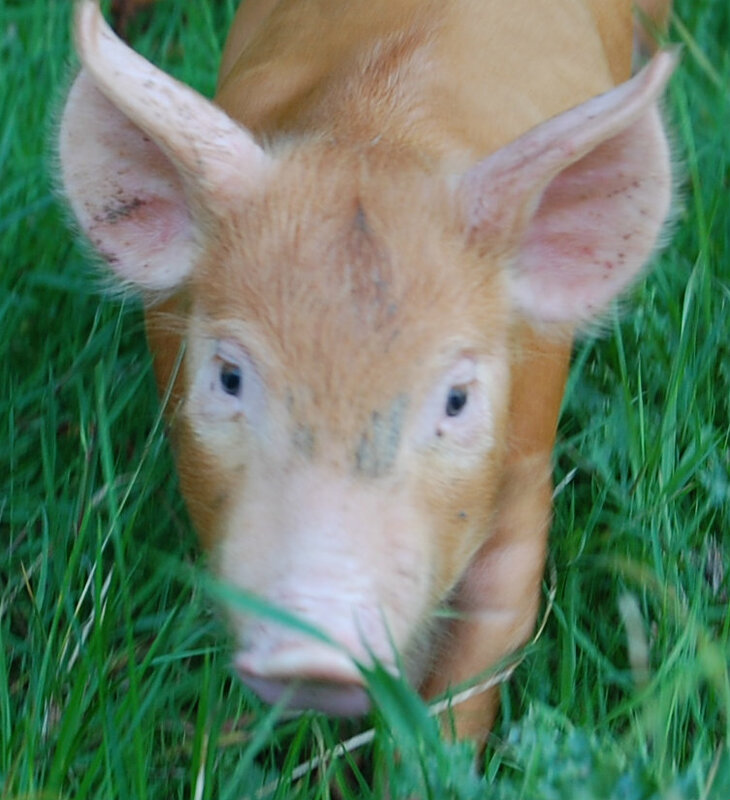 We discussed lots of technical foody things like muscle texture, intra-muscular fat, and the effect of stress on meat. They also got the chance to cuddle 2 week old piglets. On Tuesday 16th May, Oaklands Pigs hosted a school visit from the pupils of St Ronans School in Hawkhurst. 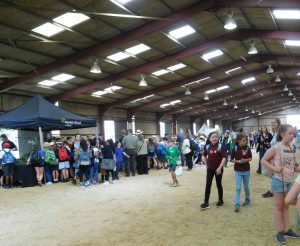 A dozen, mostly girls aged 8-10 years, attended the morning session and the afternoon was filled with boys aged 10-12 years. 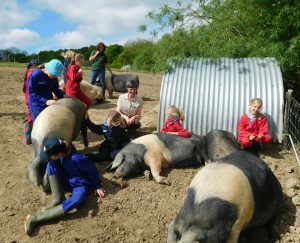 The pupils were taken around the paddock and woodland pens and met all 7 of our breeds here. 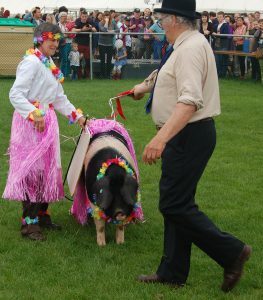 As our pigs are well handled and used to course visitors they behaved impeccably when faced with a bank of very hands-on children. 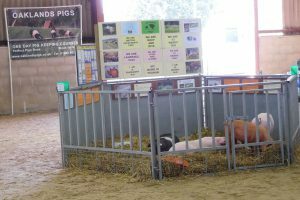 They also didn’t even mind the children getting in and sharing their arks, to see what it was like being a pig. 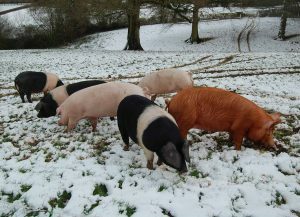 As it was a very warm day, the pigs also demonstrated how they use their wallow and tried to share some of the mud with anyone who stood too close. The pupils asked lots of questions and had a very interactive and hands-on time. 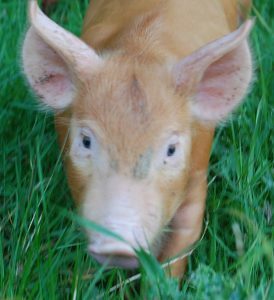 The highlight for some was being able to hold a 3 day old piglet and lots of pictures were taken. The sessions rounded off with the pupils being allowed to help with the training of the oaklands gundogs, throwing retrieves, and directing them to find tennis balls in the field. 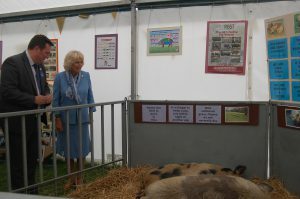 The weather forecast was pretty bleak for the bank holiday weekend, but apart from an odd brief shower, we escaped the rain at the show. 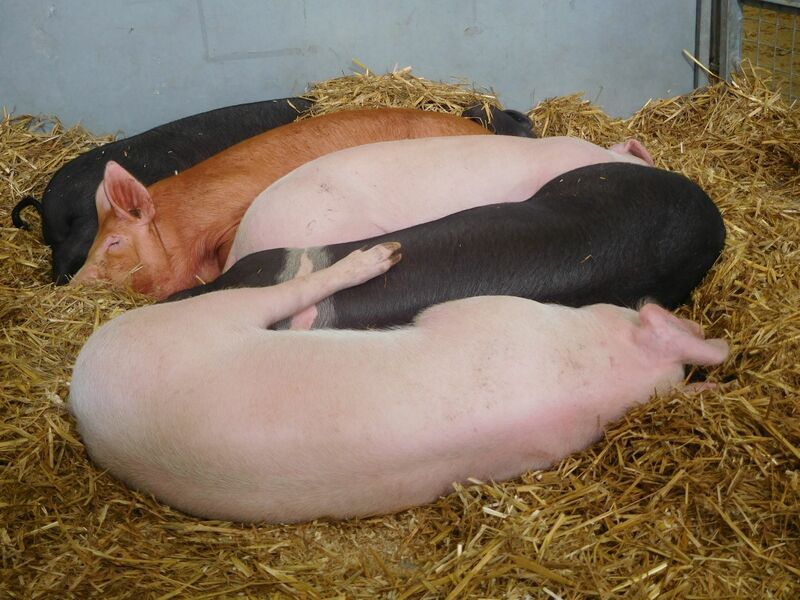 Luckily the pigs were inside the animal barn, so they were snug warm and dry all weekend. 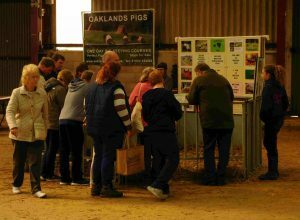 Whilst the show was not packed there was a steady footfall and lots of piggy questions to be answered. 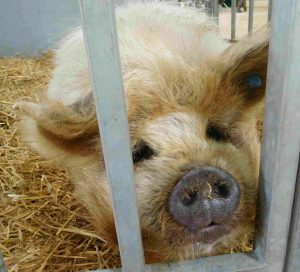 We took the two Kune Kune pigs Margot and Gerry who just loved meeting and greeting and “talking” the public. 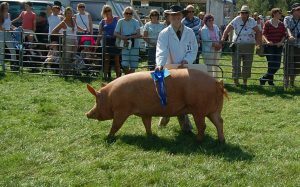 This breed is very much a grazing animal so before the show opened and after it closed we took them for a walk on the grass around the stands, much to the amusement of the other stallholders. It’s that time of year, when the girls go out on the new spring pasture. 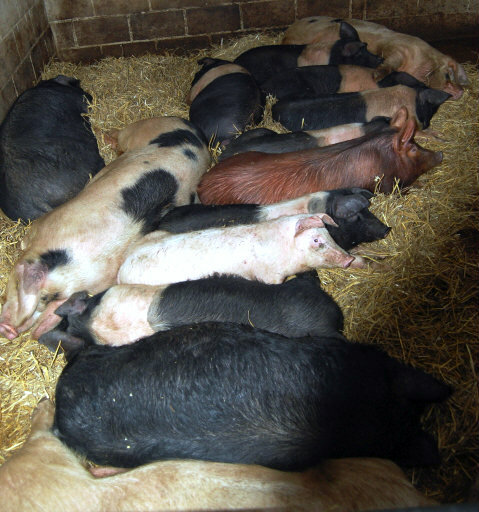 Here a squadron of 11 saddlebacks seem quite contented in the spring sunshine. 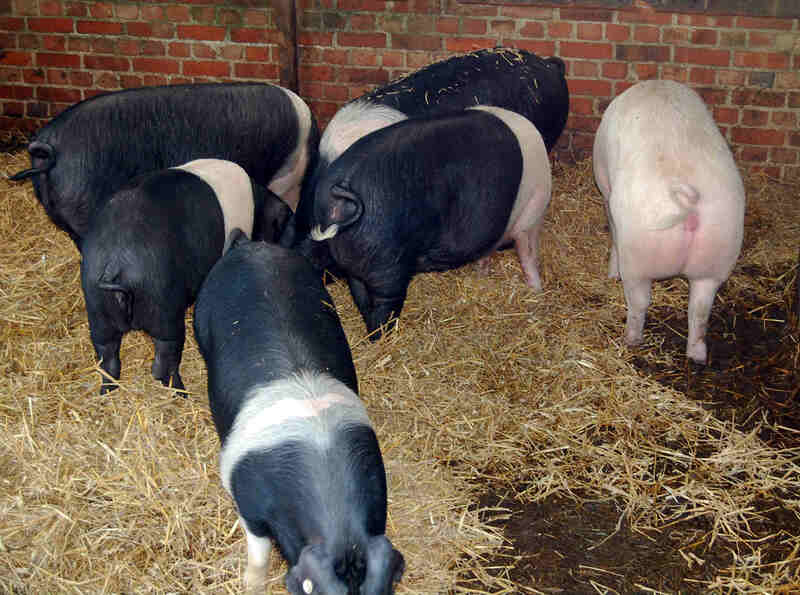 All in various states of pregnancy, some of them will soon be returning to the yard to give birth whilst the others have several months before they are due.